Fruits and veggies are vital to your overall survival food plan. There’s no doubt – in order to get and stay healthy, you’ve got to get multiple servings of fruit and vegetables each day. You’ll especially need them when facing a crisis, when these foods are hard, if not impossible to come by. There’s no other food group that’s as life giving as these orchard and garden delights… chock full of vitamins, minerals, antioxidants, and fiber. Even if you’re more of a “meat and potatoes” kind of person, most everyone enjoys a bowl of sweet, juicy strawberries or garden fresh veggies like broccoli and green beans. Truth is, without an adequate intake of fruits and veggies, your body simply isn’t getting the nutrients it needs to work right. And folks, despite what others may claim, there’s no pill you can pop that will replace them. Plant-based foods are naturally low in calories but high in nutrition. There’s no other food group (what scientists with fancy degrees call macronutrients) that can protect your body’s cells and keep things “humming along” better. Eating Fruits and Vegetables Can Help Maximize the Nutrition of Your Survival Food! When you add high-quality fruits and vegetables to your existing survival food stockpile, you’ll enjoy knowing you’re optimizing the level of nutrients your body needs. What are some other crucial benefits of fruits and vegetables? Better regularity - Fiber keeps your digestive tract healthy and helps move waste out of your system, which helps you feel your best and be “light on your feet” – which is critical when you need to move fast. Faster healing and boosted immunity - Our bodies don’t make all the vitamins we need, so we need to eat foods that are rich in them to recover faster from infections and illness, which helps if you’re injured or catch a nasty bug. Clear thinking - Whole plant foods contain the nutrients that keep your brain sharp as a tack – especially important in a survival situation. Natural anti-inflammatory - Antioxidants in fruit and veggies help protect your ticker and other vital organs by scavenging for free radicals that cause sickness. Okay… so there’s no arguing that you’ve got to have an adequate amount of fruits and vegetables every day for better health… but how do you work them into your survival food plan? I mean… fresh fruits and veggies spoil after just a few days, right? How are you supposed to survive on rotting produce? Our Fruit, Veggie & Snack Survival Food Kit comes in the same re-sealable, airtight, space-age Mylar pouches and tucked inside a stackable tote you’ve come to expect with our other survival food kits. Keep all your individual packs in the tote, or take them on the go – it’s your choice. Lasts 25 Years, But Tastes as Fresh as if You Just Plucked Them Off a Tree or Harvested Them Out of Your Very Own Garden! Native Americans and Pioneers got through the toughest winters and survival situations with the same kind of fruits and vegetables you will find in your Fruit, Veggie & Snack Kit! Plus, it’s very high in essential vitamins and minerals. You get 120 total servings of delectable, healthy fruits and vegetables to help you survive the crisis we all know is coming. It’s no secret that fruits and vegetables are essential to any diet. And when a natural disaster happens, there will not be opportunities to go to the nearest store and pick up some fruits and vegetables. Well, you know me well enough by now that I’ve made it my mission to help get as many Fruit, Veggie & Snack Survival Food Kits as I can into the hands of my fellow patriots and, because I have been blessed with the ability to buy in bulk, I’m able to cut out the middle man and give these kits away for pennies on the dollar of what they’d normally cost. 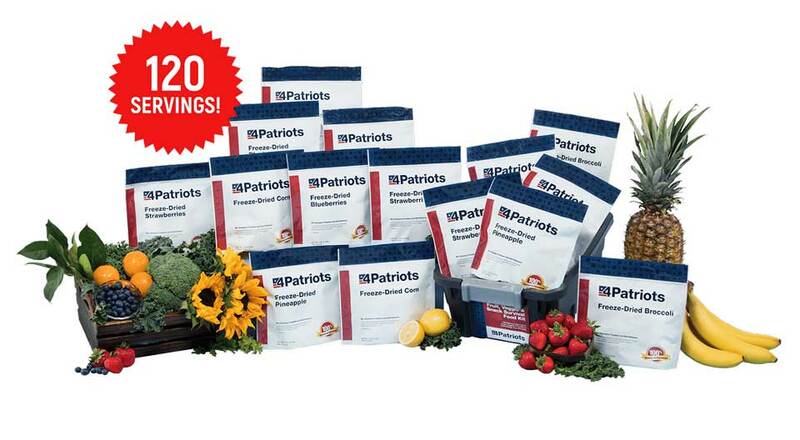 And for a limited time, you can get our Fruit, Veggie & Snack Kit for the special promotional price of just $97.00! That’s Just $0.81 Per Serving! Normally, this kit would cost around $147, but for a limited time, I want to make it available to anyone that wants to ensure their family has enough vitamin enriched foods in their stockpile. Be sure to jump on this opportunity folks… food prices are going through the roof right now, and I’m struggling to keep these kits in stock. 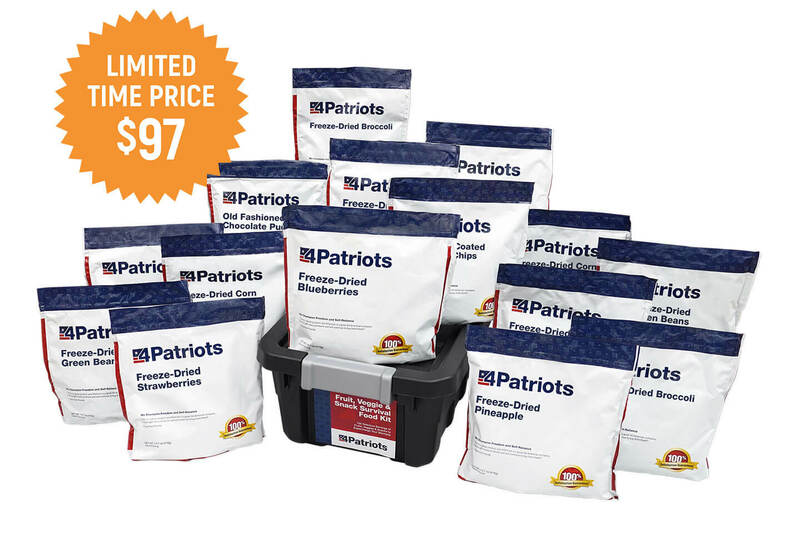 I’m not sure how long we will be able to offer this important kit for $97.00 or $0.81 per serving. This is an unheard of 300% money back guarantee. It’s in addition to guarantee #1. If you open any of the packages in your Fruit, Veggie & Snack Kit anytime in the next 25 years and find that your food has spoiled or gone bad, you can return your entire Fruit, Veggie & Snack Kit and I will triple your money back! That’s how confident I am that this food will remain just as delicious and nutritious for the next 25 years as it is on the day you buy it. Some of my friends said I was crazy to offer this double guarantee, but to be honest I’m not really worried about it, because I am so confident you’re going to see the value in your Fruit, Veggie & Snack Kit as soon as you have it in your hands. I was totally impressed with the taste of the snacks! My Grandchild ate some and they liked it which says a lot if children will eat it! Thanks to 4Patriots for helping me be prepared! Your fruit and veggie kit is good food and a great value. It's worth every penny I paid for it! I've tried the Strawberries and the Old Fashioned Chocolate Pudding. They were so good. I would recommend them to anybody. I plan to purchase more, as soon as I can. It’s all over the news… the worst drought to hit the US since the Dustbowl of the Great Depression is driving the cost of raw ingredients sky-high. Most folks recognize the need to “fill in the gaps” of their survival food stockpile to make sure their family has the most nutritious food available in a disaster. Click the “Add to Cart” button below now, while I still have these in stock. Hey listen… let’s get REAL… you don’t want to compromise on your family’s health or well-being, right? Survival food supplies are vanishing before our eyes. Being able to buy food from you that I know I can rely on gives me peace of mind. I live in Fl. where there is always a chance of natural disaster - hurricane - etc .... this helps me be prepared. Knowing if the SHTF, I will be able to survive for and extended period of time, bugging in till I can bug out helps me sleep at night. God Bless You.